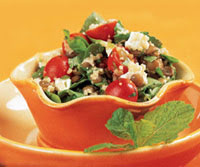 Firm, earthy-tasting French green lentils hold their own in this salad. Bring large pot of water to a boil. Add lentils. Reduce heat, and simmer 15 minutes, or until tender. Drain. Transfer to bowl, and stir in 1 tablespoon vinegar. Season to taste with salt and pepper. Cool, stirring occasionally. Pour 1-1/4 cups boiling water over couscous in large bowl. Stir in salt, cover and let stand 5 minutes. Fluff with fork, and stir in 2 teaspoon oil. Cool. Whisk together garlic paste, remaining 3 tablespoons oil, remaining 2 tablespoons vinegar and mint in small bowl. Stir dressing and lentils into couscous. Just before serving, add arugula, tomatoes and feta. This entry was posted on 1:23 AM and is filed under Low Fat . You can follow any responses to this entry through the RSS 2.0 feed. You can leave a response, or trackback from your own site.